Research supports the common sense notion that getting prompt help makes surviving an emergency more likely. The ability to get help also boosts the odds that a senior will continue to live independently. The longer a person spends helpless, the greater the likelihood he/she will be discharged into supportive care. 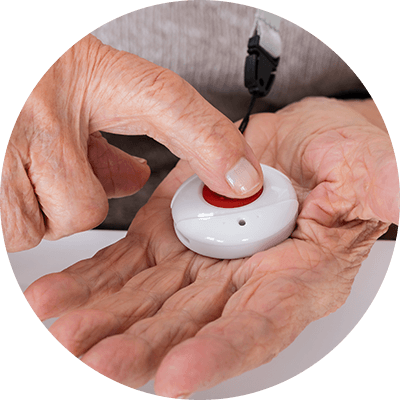 We offer services for prompt emergency health, including alert pendants and automatic medication dispensers, to boost the odds that a senior will continue to live independently. Over 150 Million 911 emergency calls are made each year in the US. After a fall or other emergency, 90% of people who get help within one hour will continue independent living, but after 12 hours without help only 10% of people will continue to live at home (New England Journal of Medicine). Freedom Alert 911 Pendant is the world’s first programmable 2-way voice activated emergency communicator. This unique pendant system allows the user to activate an emergency alarm from up to 600 feet from the base station. The speakerphone is built into the pendant so there is no need to remain close to the base station to hear the person on the other end. You can be outside, in the garage or at the other end of your home. The Freedom Alert system gives you the option to connect to 911 or up-to 4 friends or family members in case of an emergency. No Monitoring Fees, Service Charges or Contracts ever. Talk directly through the Guardian Alert to contact a 911 emergency operator at the push of a button. The Guardian Alert 911 system is a set – a base station which plugs into the phone jack – and a pendant which is worn by the user. The system can operate anywhere in and around the home – with the base station plugged into a phone jack in the central part of the home. The Pendant runs up to a year on a AAA alkaline battery. The Test Button on the bottom of the unit gives an audible confirmation of battery condition. Hold the Test Button in an extra few seconds – and you can confirm that the full system is working. Remembering to take medicines is a big task. Many elder individuals have a multiple medicines to be taken during the day. On occasion these prescribed medications are missed due to a variety reasons. Unfortunately, missing specific medications can be harmful to one’s health. But, this problem can easily be solved with the use of an automatic pill dispenser. Personal Automatic Medication Dispensers are programmable, locked devices that will automatically dispense a dose of dry medications at predetermined times. These devices also act as multi-alarm medication reminders that alert the resident when it is time to take their medication with audible alarms and blinking light. Med-E-Lert Automatic Pill Reminder Dispenser helps to ensure that medications are taken properly and on time. The Med-E-Lert is supplied with clearly printed discs. The discs identify the day of the week, and the appropriate number of doses per day (1, 2, 3, or 4 doses per day). Organizing the medication, assigning dose times and determining what medications go into each slot is the responsibility of you, your caregiver, and/or your health care provider.